I hope everyone had a great weekend! Now that the Super Bowl is behind us, we’re moving right into Valentine’s Day! 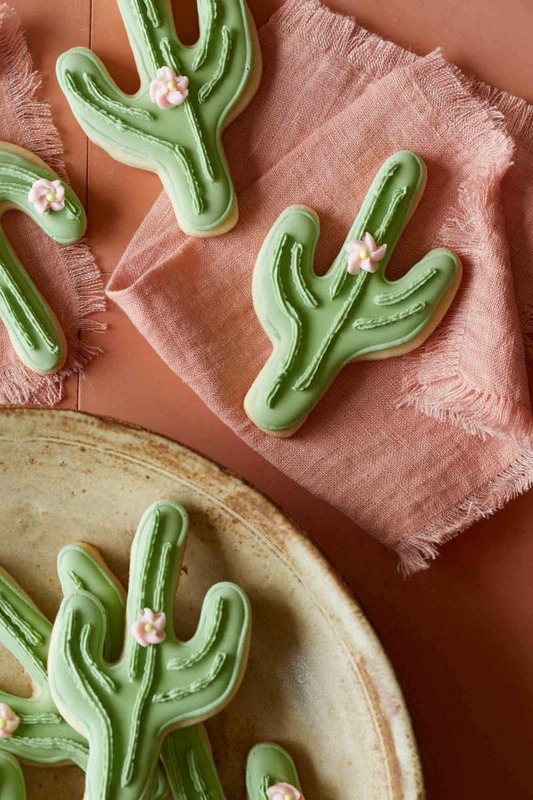 We’re starting things out with these cute little cactus cookies!! These guys are a little time consuming for sure, but they make a really fun Galentine’s Day project….especially with lots of wine and snacks! Watch the video below for the piping technique in action! 2. In a stand mixer or with a hand mixer cream together butter and sugar. 3. Add milk, egg and vanilla and continue to mix. Scrape down sides of the bowl. 4. In another mixing bowl, whisk together flour, baking powder and salt. 5. Pour flour mixture into the butter mixture and mix until evenly blended and a dough forms. 6. Divide dough into two discs, wrap in plastic wrap and refrigerate for 1 hour. 7. Lightly flour a clean surface. Roll out 1 disc of dough to 1/8 inch thickness. 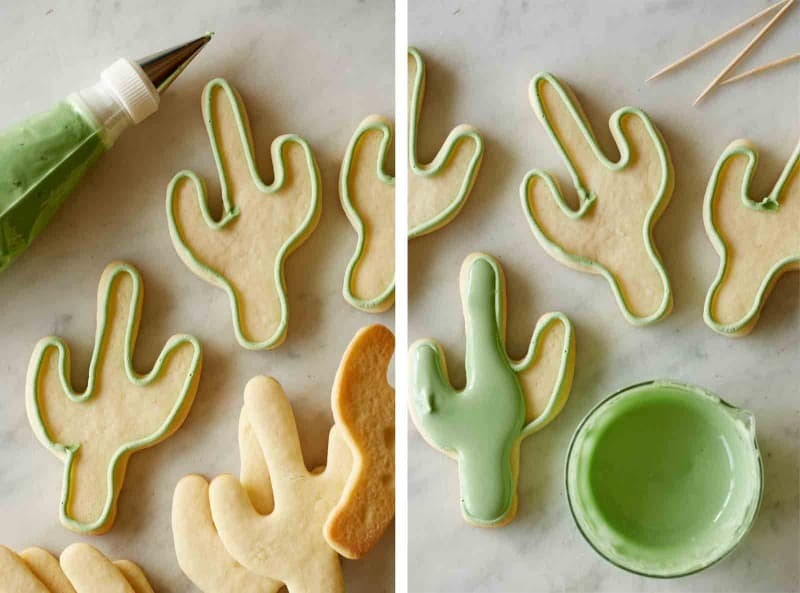 Using a 3 inch cactus cookie cutter punch out 20 cactus cookies. 9. Bake cookies for 7 to 9 minutes or until cookies barely begin to brown around the edges. 10. Remove from heat and transfer onto a cooling rack. 11. Royal icing: In a stand mixer, fitted with a whisk attachment or in a large bowl with a hand mixer, whisk together egg whites until light and frothy. Begin adding sugar, 1/2 cup at a time until fully incorporated. Continue to beat mixture until light, fluffy and shiny, 7 to 8 minutes. 12. Divide the royal icing into 3 bowls and color two of the bowls with green food color and color one with the red/pink food coloring. 13. To decorate: Fill a piping bag with one of the green royal icings and fit it with a small round tip and a coupler. Pipe a border of the royal icing around each cactus cookie and allow icing to dry. 14. Add 4 to 5 tablespoons of water to the other batch of green icing, to loosen. Once the icing border dries, ‘flood’ each cookie with the loose, green icing, popping any air bubbles with a toothpick and allow icing to dry. 15. Once the icing dries, change the small round piping tip to a small star piping tip from the piping bag with the stiff, green icing. 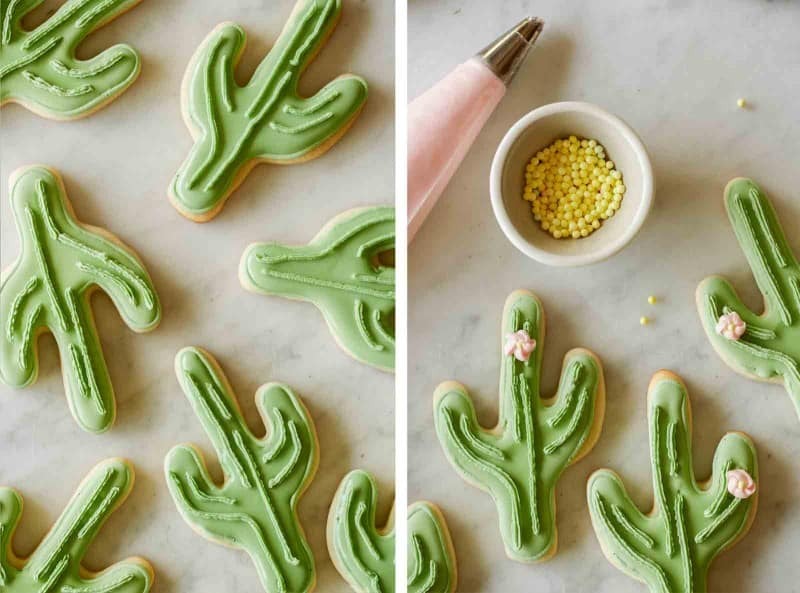 Pipe lines onto each cactus cookie for texture and allow icing to dry. 16. Fill a piping bag with the red/pink royal icing and fit it with a small star tip. Pipe a small ‘flower’ onto each cookie and finish with a yellow sprinkle in the center of each flower. Allow cookies to dry and serve. 17. The cookies will keep fresh in an airtight container for 1 week. I’m a long-time follower of your blog (and don’t think I’ve ever commented), but I clicked this recipe from Feedly (which didn’t produce a preview pic) because I curious what the heck cactus butter was! LOL :) These are adorable. Hello, I am just now finding your blog and just signed up. 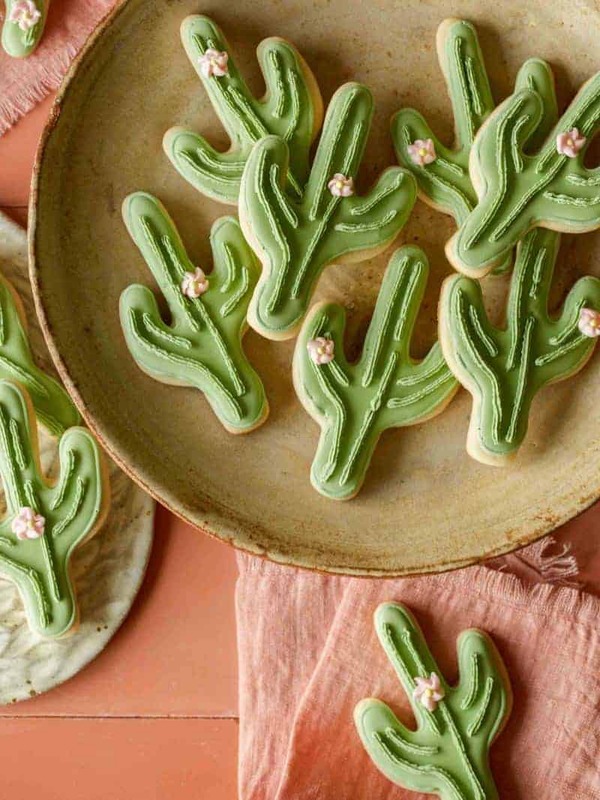 A bride wants these cactus cookies and I am wondering if you would tell me which vendor you purchased the cactus cookie cutter from? Thank you. I have purchased 2 cutters already and they are the wrong size and shape. I hope you don’t mind. I appreciate your sharing with me. Hello! I bought my cutter off of amazon + it’s 4 inches long. I will add the link to our post shortly! I wouldn’t really try to scale the recipe down that much to make sure the integrity of the cookies remains the same overall. You could definitely cut the recipe in half though, which would use about 1 1/2 tablespoons of a beaten egg.